Cottage or Cabin: What’s Your Style? Do you prefer the light and airy look of a cottage or the warm and rustic style of a cabin? As you may have noticed, I’ve taken a break from blogging the past week. Every summer, I try to totally unplug for at least for a few days, as I find it helps clear my head and freshen my perspective. Letting go is much easier to do when you’re in a beautiful setting alongside people you enjoy spending time with. Fortunately for us, we were invited by our dear friends to spend time at their parent’s cabin in beautiful Invermere, British Columbia. As I’ve mentioned before, having a cottage or cabin of our own is on our bucket list. We don’t plan on purchasing in the next year or two, but we have a basic idea of where we want to be. We’ve also started compiling a rough wish list, including an Ideas for the Cottage board on Pinterest. One thing we haven’t fully determined is whether we want a cottage or a cabin. When I think about cottages, images of beadboard, chipping paint, slipcovered furniture, watery hues, and light-toned wood come to mind. Cabins, on the other hand, tend to be on the rugged side, with deeper toned walls, textured fabrics, natural stone, and a lot of exposed wood. Because we enjoy activities associated with both summer and winter, choosing just one style is difficult. Cottages remind me of easy breezy summer days at the lake with impromptu gatherings on the patio in the evening. Cabins make me want to curl up by the fireplace with a hot cup of cocoa after a day of tobogganing or skiing. See how simple the bedding and decor could be changed for summer. I love the rustic stone, beams, and floor juxtaposed against the airy white walls. Perhaps what we’re looking for is cottage cabin style rather than one or the other. Would it be easy for you to choose just one distinct style or would it take some pondering? Hi Shauna! 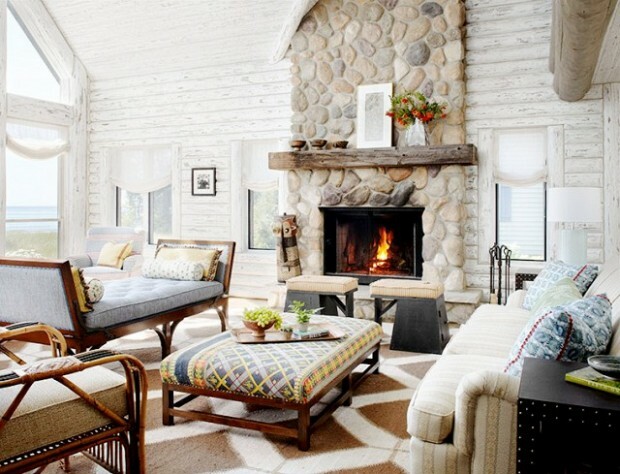 I think you have nailed it: cottage cabin style! It is a good thing these two styles fit together well. 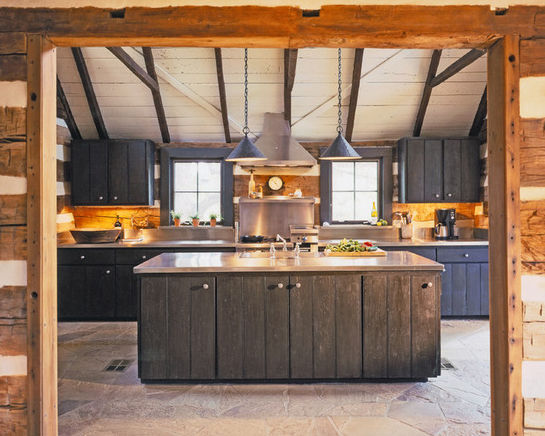 I am more of a cottage girl liking the light, airy look and my husband is a cabin guy who likes wood, stone and texture. I interject cottage in where I can! My office, the guest room, etc. Love these photos you have used to illustrate these styles! It’s great you’re able to make a compromise. I think your place is a good mix of both. can i choose both!!!! i so love them both! :) for me it depends on the house and the area you love in though. So true! Cabin on a mountain by a ski hill and cottage by the lake. Too bad we can’t have both! Oh I love both of these styles, so hard to choose. But since I have a log home or I guess I should say, log cabin, I’m a little partial to it. I try to keep everything in it quite light and bright due to the darkness of the wood. I just did a few furniture makeovers using yellow to help lighten some of the spaces. That along with some black light fixtures and hardware, to give it the right amount of masculinity, I’m thrilled with my country cabin. Sounds like you’re style is somewhere in between. Your place must be gorgeous! Those interiors are amazing – I think I could happily take any of them! I think somewhere in between is what I would choose, a rustic cottage. That sounds wonderful! I think that would be the perfect marriage between the two styles. Now it’s just finding something that fits our wants/needs! I know, that’s what makes it so difficult! Both looks (and them combined) look great! I like to incorporate both cottage and cabin in my decorating, leaning a little more towards cottage though. Thanks for the pretty photos (Pin, Pin & Pin!) and nice to see you back from your bloggy break!! Thank you for all the pinning, Heather! 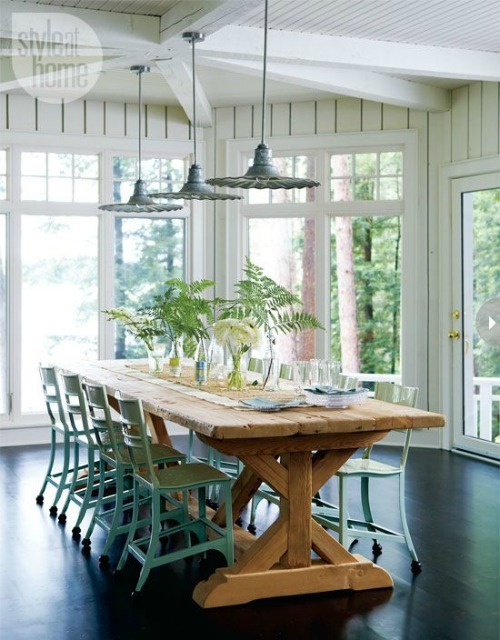 Love the fresh oceany feel of the cottage look. Makes me feel totally relaxed. That twine/fabric wrapped table is bananas! Glad to have you back on the blog! I’ve been feeling the need to step away from the tech quite a bit this summer. Cottage style is relaxing for sure, and I think that’s the appeal. That fireplace is insane. Perhaps not during the two months of summer we actually get around here, but the rest of the time! So true! I think the perfect balance may be a rustic fireplace, wood floors, lighter walls and painted furniture. 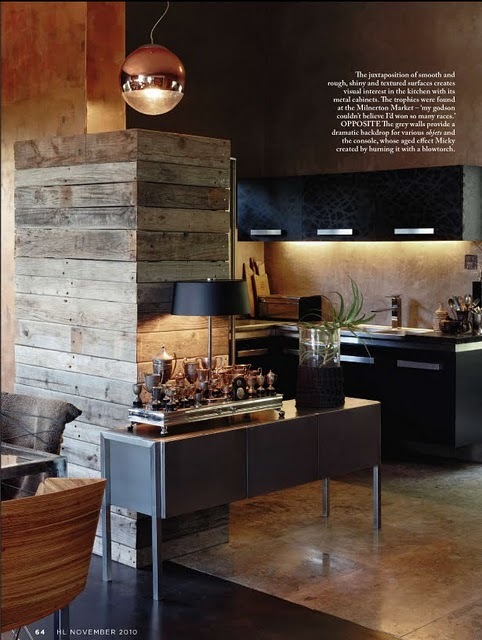 That keeps it from feeling too heavy, but gives the rugged feel that’s so beautiful in cabins. Thanks for stopping by!